Ready for the road and equipped to add excitement to your next show, the black Odyssey Innovative Designs Universal CD/Media Player DJ Coffin is a Flight FX Series universal CD/media player DJ coffin that provides reliable equipment protection, easy transportation, and a built-in light show. 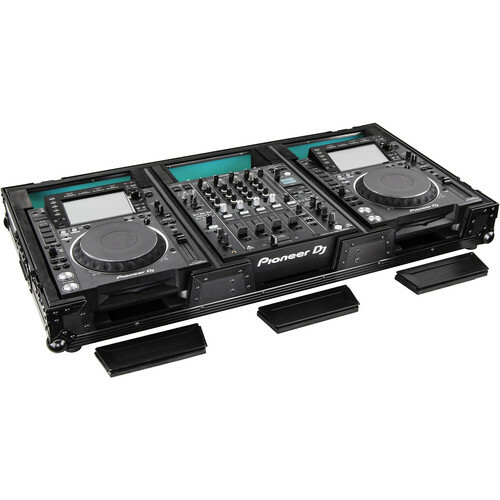 Thanks to width-adjustable sections, it holds two large-format CD/media players and one 12" format DJ mixer with plenty of additional space for cables, adapters, and accessories. The crowd-facing LED panel features seven colors, an array of modes, and powerful customization via its included controller box. Remove the three front panels for access to your players' CD/media slots and mixer's front headphone jacks while your equipment remains securely in the coffin. A rear cable port allows orderly cable management, reducing the need for numerous cable ties. Ventilation pits ensure sufficient airflow to keep your gear cool. When it comes time to pack up and head out, recessed latches, spring-loaded handles, and built-in roller wheels make transport quick and straightforward. With a limited lifetime warranty, 3/8" plywood construction, and heavy-duty hardware, the Universal CD/Media Player DJ Coffin is built to endure the stresses of routine touring.